These parts of Kate and Joe are such great parts, two of the best parts in the American canon. The score has a vision and a unity which is utterly engrossing and delightful; and it is overflowing with female voices, a rare treat in itself. Full Orchestra. Star Cast. Spectacular Score. With the centennial year of the First World War dominating theatre themes this year, it seems a fitting time for the return of Howard Goodall's World War Two based, Girlfriends. The production follows a cadre of the Women's Auxiliary Air Force - as the women's section of the RAF was known in those days! The Brit and BAFTA award-winning, Goodall CBE, wrote the music and lyrics based on the book he wrote in collaboration with Richard Curtis and John Retallack. London Musical Theatre Orchestra (LMTO) bring this concert version to the Great Hall at Bishopsgate Institute in London as the Orchestra in Residence. LMTO boasts being the world's only professional orchestra dedicated to performing a musical theatre repertoire. The charity's public launch in 2016 brought widespread acclaim with Freddie Tapner as Principal Conductor. Tapner, also the orchestra's founder, made his own professional debut with this very piece, for which he earned a Best Musical Direction nomination at the Also Recognised Awards 2015. The concert production will be led by Lucie Jones as Lou and Lauren Samuels as Amy, with further casting still to be announced. The LMTO and Bishopsgate Institute co-production, features new orchestrations by Simon Nathan. Along with Goodall's compelling score, the melodies and choruses will transport you to the comradeship and solidarity of those thankfully far-off wartime days. 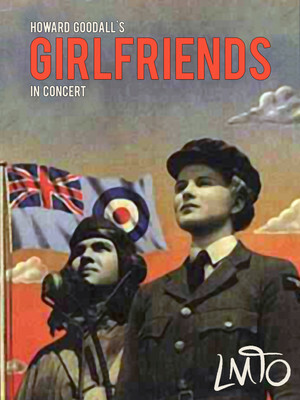 Girlfriends explores the relationships between members of the Women's Auxiliary Air Force (WAAF), as they navigate the Second World War on a Bomber Command base in the east of England, circa 1941. This mix of women, brought together through extraordinary circumstances, form friendships as they undertake all the 'behind-the-scenes' tasks that keep the air-force ticking. The show applauds these women who struggled against rising fascism, who lived through the tempestuous days of war and whose inherent mettle still inspire many today. Sound good to you? Share this page on social media and let your friends know about Girlfriends at Great Hall. Please note: The term Great Hall and/or Girlfriends as well as all associated graphics, logos, and/or other trademarks, tradenames or copyrights are the property of the Great Hall and/or Girlfriends and are used herein for factual descriptive purposes only. We are in no way associated with or authorized by the Great Hall and/or Girlfriends and neither that entity nor any of its affiliates have licensed or endorsed us to sell tickets, goods and or services in conjunction with their events.